A swimmer was bitten by a shark in Florida on Sunday. The man was in the water off Flagler Beach near North 10th Street around 8:30 a.m. when he was bitten. The 64-year-old was bitten once on his left leg. According to The Daytona Beach News-Journal, Flagler County Fire Rescue Battalion Chief Jamey Burnsed said the man was able to leave the water under his own power. He then made his way over the dunes and across a highway before contacting rescue services. When medical personnel arrived on scene, they found the man had bandaged his own wound. He was transported to the Florida Hospital Flagler for treatment. Although this may be his first experience with an in-water shark bite, Stocker has seen fisherman bitten before. “Sometimes fishermen might catch a shark and when they’re trying to get the hook out they might get bitten, but never anything deadly normally. Just bandage it out,” he said. Stocker recommends that any beach-goer who spots a shark notify life guards so they can remove swimmers from the water. 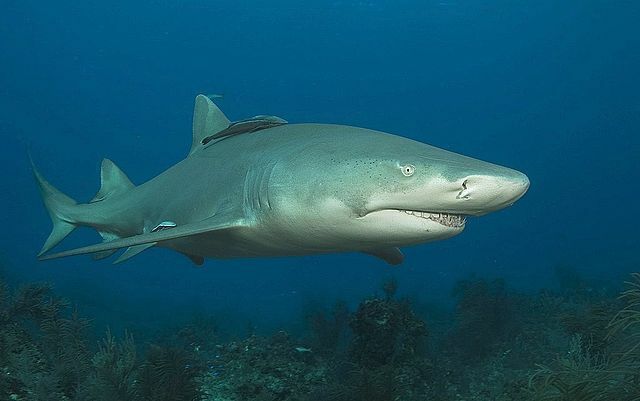 There have been a total of thirty-six shark attacks bites in 2016, five of which were fatal, 12 total in the US, with 10 of those occurring in Florida.